Download a home vegetable garden plan to suit your gardening needs. How to grow a vegetable garden at home. 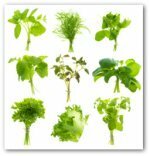 Do you want to create a vegetable garden plan that works for your unique situation? 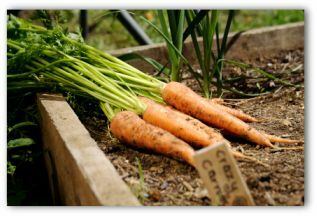 There are many ways to grow vegetables at home besides the traditional in-ground backyard garden. Small home vegetable gardens can be grown in containers on a balcony or porch. A simple raised bed vegetable garden can be built in a weekend, and add beauty to a patio, or even the front yard. 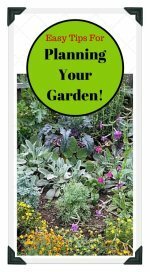 All you need is a sunny location, and you can plant a garden that will provide many delicious fresh vegetables for your family to enjoy throughout the summer and fall. Garden happiness is harvesting fresh produce grown just outside your back door. For memorable family meals, design a home vegetable garden plan that supplies all your favorites and maybe a few surprises. Start with growing basic favorite vegetables such as tomatoes, lettuce, onions, carrots, and peppers. If you are adventurous, leave room in your plans for growing some unique plants as well! Choosing which vegetables to grow will largely depend on the size area you have to work with, soil conditions, and your regional climate. Take advantage of your region’s typical weather patterns in designing your home vegetable garden plan. For example, if your area receives extraordinary amounts of rainfall, plant vegetables that thrive in wet conditions. 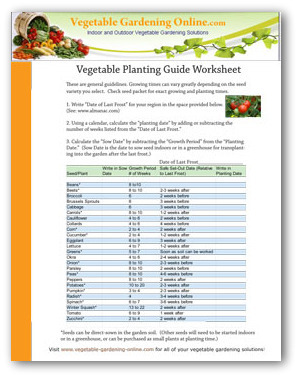 Download our Vegetable Planting Guide to calculate specific planting times for your area. 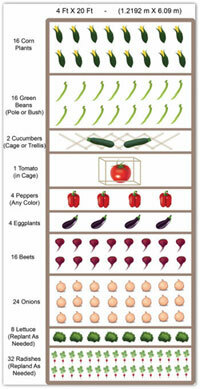 Start small, and begin with a basic home vegetable garden plan! 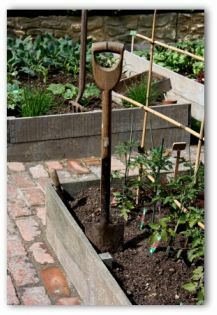 We have several vegetable garden plans available for download on our "free garden plans" page. You may look at your backyard now and wonder how anything would ever grow there. With a bit of ingenuity, you can change your entire landscape from barren to beautiful and productive! Watch as the sun moves in your yard to see which areas get the most light and which parts are shaded most of the day. This helps determine how your garden will fare as well as the perfect spot to plant. Most vegetable garden plants require a minimum of 6 to 8 hours of sunlight per day. 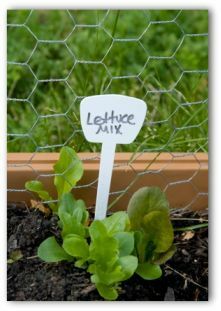 Lettuce, spinach, and other green leafy vegetables will do well in partial shade. Make a plan to water your home vegetable garden when you cannot be there such as while on vacation or working out of town. There are timers available that can be placed on your water faucet attached to soaker hoses or lawn sprinklers that will turn the water on for you at a specific time each day. Self-watering planters are another option. When planting your vegetable garden, follow the instructions on the individual seed packets or small plants that you purchase. Remember that some vegetables such as lettuce, corn, green beans, and radish can be planted every three weeks to extend the harvest throughout the growing season. Even when making your first home vegetable garden plan, it is fun to include one or two unusual vegetables that your family enjoys eating! Swiss chard is easy to grow and recommended for beginner gardeners. It grows well in sandy soil or sandy loam soil. Improve sandy soil with organic matter. Keep soil moist and mulch to encourage tender growth. Sown in the fall, it is heat tolerant and can live through the summer. Swiss chard is leafy, ruby-stalked with a spinach-like flavor. Both leaves and stems are edible. Stir leaves into hot rice or pasta before serving or steam and toss with vinegar, salt, and pepper. Growers of calabaza, also called Cuban squash or pumpkin, have been known to produce 40-pound pumpkins. Calabazas keeps for months in cool dry storage. Most gardeners start the plant from seed. Calabaza grows spring through summer in cool regions and year round in warm areas. Sow seeds four feet apart, adding manure to the planting site. Water and fertilize the same as winter squash. The first harvest will be ready in 90 to 100 days. Chives are a petite member of the onion family. Chives grow as perennials in garden soil, but they demand regular watering and generous mulching due to its roots growing close to the surface. Plants appear in spring. To harvest, snip do not pull. The flavor and texture are best eaten raw. The key to gardening success is creating a home vegetable garden plan that works for your needs. Start with a simple or basic garden, and improve it little-by-little each season. Include your family in your gardening adventure, as gardening is a life-skill that benefits everyone. It is also a great hobby that is fun and relaxing!